In this sequel of BARN’s monthly BCB podcast, Catherine Camp of the BARN board highlights upcoming events, arts workshops and learning experiences at the Bainbridge Artisan Resource Network (BARN). Among the upcoming classes and events described by Catherine in this podcast are a wide and diverse array of arts and creative skills. 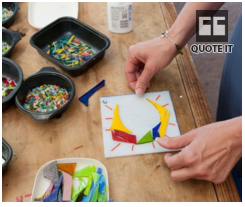 – Glass Studio: Carol Baker will offer tips and tricks for finding supplies and sources of glass online. Wednesday, Feb 10th at 10am. – Doll Making: Sue Van Duine offers a 5-session class on the full-range of doll-making skills. Starting Thursday Feb 18th. – Malas and Mantras: This mala bead-making class will be Friday, Feb 19th, 10am to 1pm. – Electro-Etching: This technique makes flat-metal designs visually stunning. Beginners are welcome on Saturday, Feb 20th at 10am. – Teneriffe Lace Making: This 3-session course starts Feb 24th in the evening. – Linocut Block Prints: Leigh Metteer, a long-time printmaker, teaches on Saturday, Feb 27th. – Electronic and Technical Arts: See a demo of a drone watercraft on Sunday Feb 28th at 4:30. – Glass Artist: Michael Dupille teaches how to paint with “frit” (crushed glass) on Wednesday March 2nd. – Wire Crochet: Learn the basics on Saturday, March 5th from 9am to 1pm. For a calendar of events and further details, visit the BARN website. Credits: BCB host: Joanna Pyle; BCB audio editor and social media publisher: Barry Peters.